Show me a new way to do eggs and I’m all ears! Most brunch/ breakfast dishes I eat revolve around the humble egg. I wanted to share with you guys one of my fav, easy and super tasty, not to mention totally Pinterest worthy looking brunch recipes. 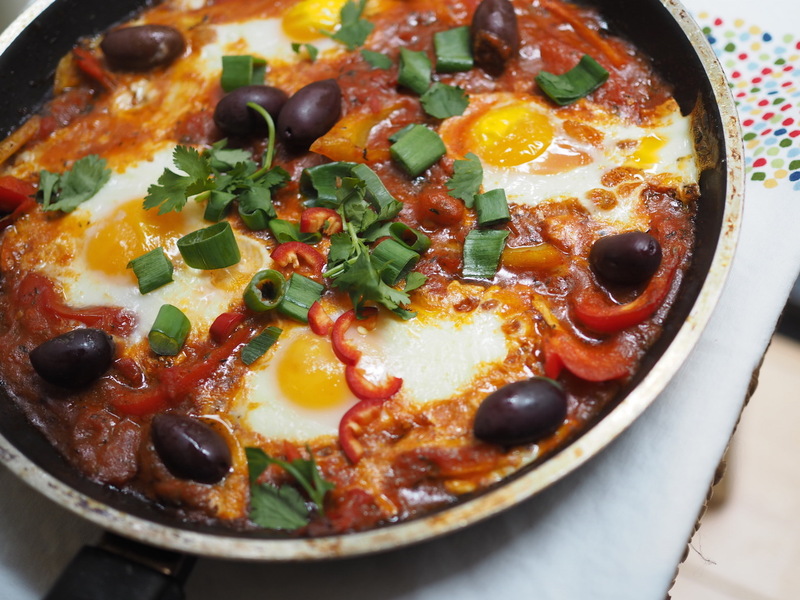 My Turkish-style 1 pan eggs are cooked in a chunky spicy tomato sauce with a dollop of garlic and chiptole yogurt. This is a gutsy and genuine street food style dish with the spicy tomato sauce best served up a little chunky. The cooling, garlicky Greek yogurt gives the dish a palatable freshness. I like to make my tomato sauce in advance and then use throughout the week in different dishes or this one again (as once I’ve had it, it’s on rotation for a while!). Turn on the grill to a medium setting. Heat the oil in a heavy-based frying pan. Slice up and stir in the sliced bell pepper and chillies (leave one chilli for the end). Cook until they begin to soften. Add the chopped and canned tomatoes and season to taste. Cook until the liquid has reduced. 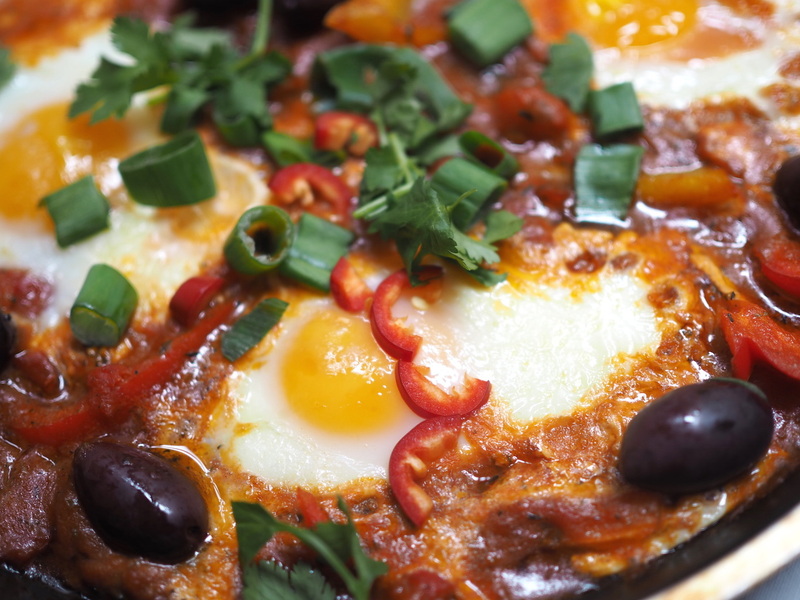 With a spoon, create however many pockets in the tomato sauce you need (1 per egg) and crack the eggs into them. I usually crack in two eggs per person. Cook the eggs over a low heat until just set then finish off under the grill. Beat the yogurt with the garlic infused olive oil and add some smoky chipotle seasoning over the top. Sprinkle the dish with parsley, the leftover red chilli and chopped green ends of the spring onions and serve from the frying pan with a dollop of the garlicky yogurt. Although this recipe has no meat it also goes great with small, hand formed turkey mince patties. Feeling extra hungry? Serve with a few toasted slices of sourdough bread. Don’t forget the coffee or fresh orange juice. *If you are not fussed about this recipe being IBS friendly then you can add in onions into step one and use crushed garlic cloves and regular olive oil instead of the garlic infused olive oil.